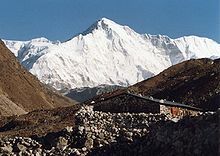 Cho Oyu (Nepali: चोयु;) is the sixth tallest mountain of the world. It's height is 8,188 metres (26,864 ft) above sea level. It is located in the border of Nepal and China. The mountain was first climbed by Herbert Tichy, Joseph Jöchler and Pasang Dawa Lama. ↑ Everest News.com. "Cho Oyu History". Retrieved 2008-04-12. Wikimedia Commons has media related to Cho Oyu. This page was last changed on 2 April 2018, at 05:45.